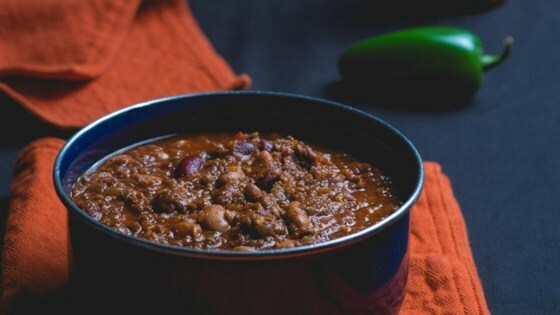 "This spicy chili recipe uses ground buffalo. To step up the heat, use different peppers and experiment with the seasonings. This gets even better if you let it sit overnight. The chili is so good you'll need to find another way to use up your cheese and crackers." Brown the buffalo in a skillet over medium heat; season with 1/2 teaspoon cumin and 1 pinch cayenne pepper, or to taste. Drain excess grease. Combine the buffalo, tomatoes with green chiles, tomato soup, kidney beans, chili beans, onion, garlic, Anaheim chile pepper, poblano chile pepper, chili powder, red pepper flakes, 1 1/2 teaspoons cumin, 1/2 teaspoon cayenne pepper, salt, and black pepper in a slow cooker. Cover and cook on Low overnight or 8 hours. Not much of a bite! Very Good Chili!! So easy, my husband whipped up a batch in no time. Followed recipe as stated. Thank you for making it easy to follow. Love this extremely healthy and tastey version of chili!!! So little grease! Yummy kick of peppers and cayenne. This recipe was only 4 servings. I will double it next time.